A very lengthy 10 7/8" overall, with a triangular blade that measures 5" by 3" at the widest, and weighing 3.1 T. oz., this pie or pastry server dates to the third quarter of the 19th century. 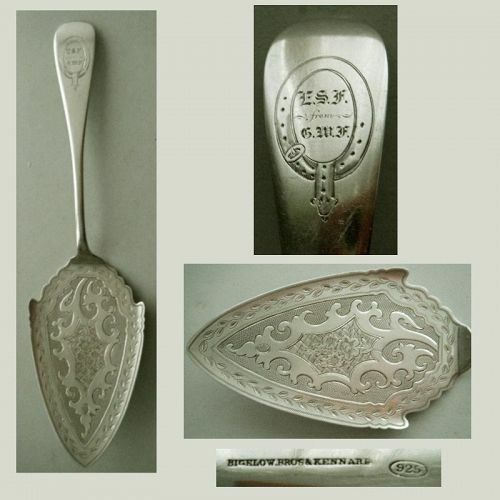 It is marked "Bigelow.Bros & Kennard" for the major Boston firm that operated under several name variations, and "925" in an oval for sterling silver. Stamped with the pattern number "17070," which was put into production in 1911, this piece is also marked "Tiffany & Co.," "Sterling," order number "1393," "Sterling," "925-1000," and "m" (used 1907-47). Solid silver, it is a 2" high, 2 1/2" top diameter, 1.9 T. oz., master salt dip that sits on a rimmed pedestal base 1 1/2" across. This example is a 9 1/2" long, 2.1 T. oz., ice cream server. The blade has a curved and upswept lower edge that leads to a pointed tip. The upper edge is raised and has a scalloped flange edge, which repeats on the lower shoulder. The surface is engraved with a rosette motif with acanthus leaves leading from this. 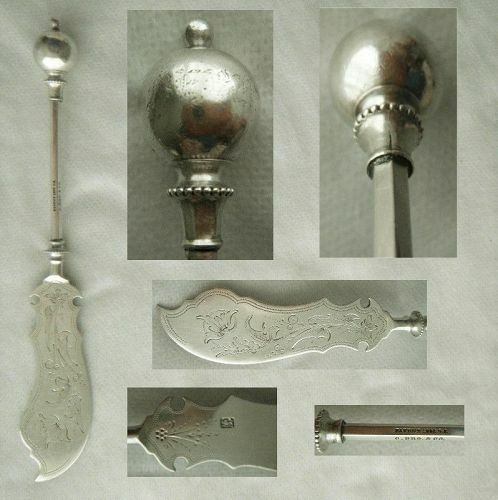 New York City manufacturer Wood & Hughes responded to the pronounced interest in and popularity of "Medallion" pattern silver by producing several different series. The example on this 7 1/8" long, relatively weighty at 1.6 T. oz., place fork is commonly referred to as "Diana" for the classical, female goddess portrayed without variation on all the pieces. It dates from 1863 and was made to a coin silver standard, as indicated by the "WwH" stamped on the reverse with no additional marks. 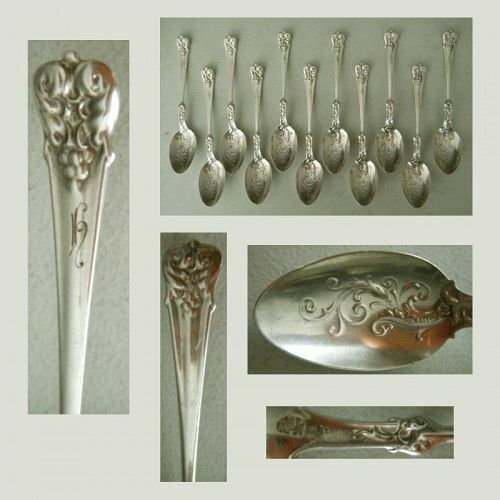 Each measuring 4 9/16" long, with the set weighing 2.4, these six, matching, coffee spoons trace to the mid 19th century. They are stamped "T[heodore] Evans & Co.," for the New York City and Newark, New Jersey firm with dates 1855-65. The pattern on these is a "French Thread" aka "Fiddle Thread" aka "Plain Thread" and they are monogrammed "Hofman." in script lettering set sideways on the handles. Price for the set of three pieces. A complete youth grouping, consisting of a 6 3/4" long knife, 5 7/8" long fork, and 6 1/16" long spoon, 2.7 T. oz. combined weight, this set was made by New York City's John Wendt, and retailed by "Ball, Black & Co.," with whom Wendt was closely affiliated. 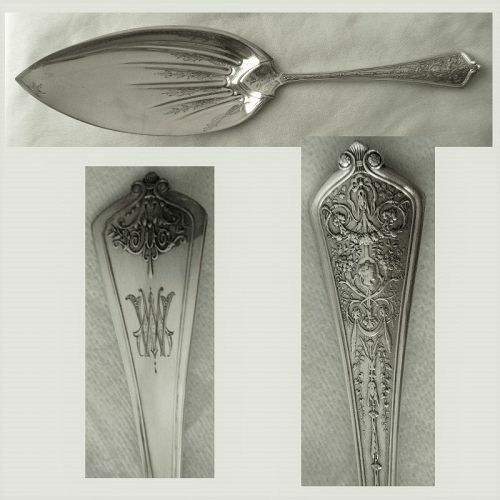 The pattern is "Medallion" dating from the 1860s, and features Wendt's young male figure on the fork and spoon, and his less commonly found female image on the knife. Price for the set of twelve. A non-line pattern, these twelve, matching, 4" long, 3.5 T. oz. 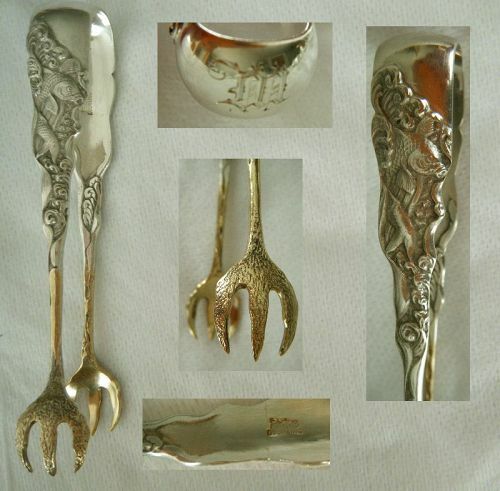 the lot, likely cast handle rather than die struck, coffee spoons are as singular as they are appealing. 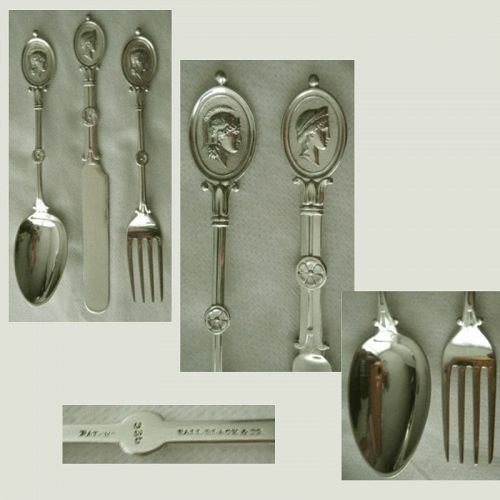 Made by Whiting, the company's "lion" emblem and "Sterling" are stamped on the backside of each piece. Issued in 1880, Wood & Hughes' "Humboldt" pattern incorporates Moorish design elements, as popular in the period, laid out on an angular handle. Produced at a time when the company was enjoying great prosperity and was especially productive, it exhibits sophisticated design and high quality execution. This is especially evident in the plum-shaped, notched edge, bowl that is intricately engraved and finished with a matte gold surface on the interior and bright gold on the exterior. A particularly fine rendering of "Hizen," one of Gorham's most exotic patterns, these 4 1/2" long, .9 T. oz., tongs are in immaculate estate condition, evidencing neither wear nor damage. A multi-motif line issued in 1880, the style draws upon Aesthetic sensibilities. The primary element of the design is a fish, possibly koi, set against a raised background suggestive of marine elements, including waves and seaweed. An effective implement "holding a registered dram resting level on the table," (The Pharmaceutical Era volume 27 - google) this spoon was marketed to druggists and apparently was a well-received, utilitarian, item. Solid silver, it measures 4 1/2" overall, weighs .9 T. oz., and has an elongated bowl with a narrowed and splayed mouth, which is finished in a soft satin gold wash. This lengthy, 7 3/4", and heavy, 1.8 T. 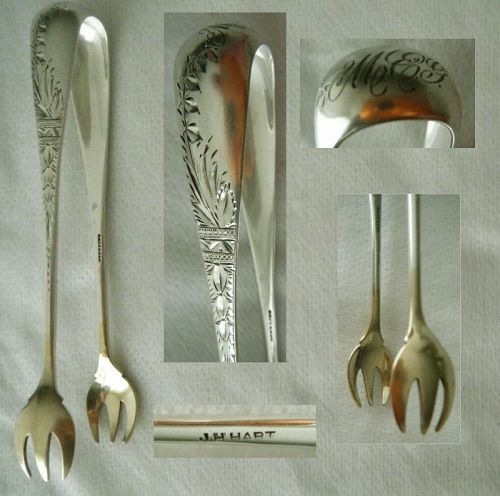 oz., master butter knife was made by Philadelphia's George Sharp, who was the manufacturer most associated with a style of ball, dome, sphere, and various other similar shapes popularized in the 1860s. This "Ball End" form is an especially appealing piece, with a shaped blade with notched shoulders and an engraved surface with roulette bordering. The ball itself is inscribed with a rubbed Old English monogram that appears to read "MEBH." Patented in 1878, and so stamped on the reverse of this 8 3/4" long, just over 2.1 T. 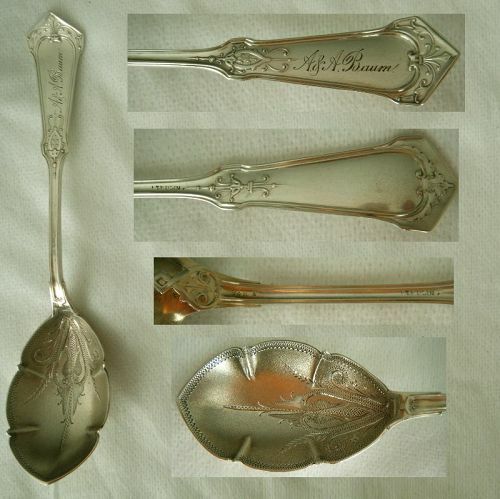 oz., berry spoon, this "Cupid" design was developed by Morgan Morgans Jr., New York City, who with Samuel Montgomery, bought Albert Coles' business in 1877 and continued to use the later's three part pseudo hallmark, which also appears on this along with the word "Sterling," until he sold the firm to George Shiebler in 1883. Identified as "Owosso" in engraving set sideways on the lower portion of the handle, this teaspoon features an intricate, high relief portraiture of the Shiawassee American Indian leader who is remembered as a signatory of the Treaty of Saginaw (Michigan) in 1819 and the Treaty of Detroit in 1807. He is also known as "Wosso" or "Wasso," although the name "Owosso" carries on in the Michigan city which takes its name from him. This 7 5/8" long, approximately 1.3 T. 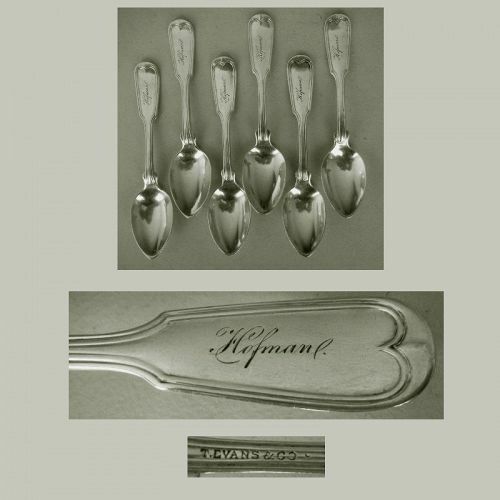 oz., coin silver, preserve or jelly spoon has a double provenance in that it is stamped with a Gothic "W&H" for Philadelphia's Watts & Harper manufacturer, and with the name "C.F. Greenwood," for the Norfolk, Virginia, jeweler. 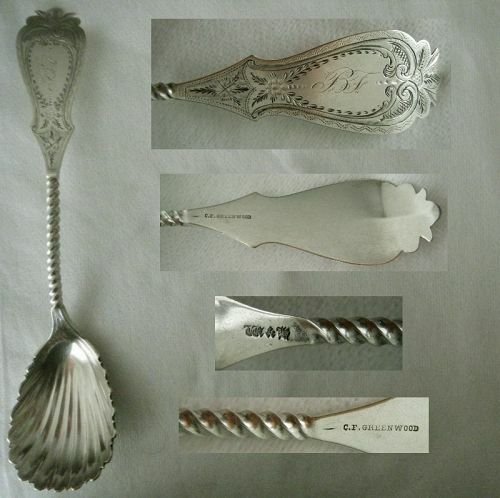 Catherine Hollan in Philadelphia Silversmiths gives narrow dates for the W&H partnership, 1859-61/62, while Cutten's Silversmiths of Virginia indicates Greenwood began his business about 1850. Larger than most such pieces, this fish slice measures 12 1/8" long and weighs a substantial 3.7 T. oz. The pattern is "Lady Washington," which is one of Gorham's early lines, dating from 1876, the year of the American Centennial, which may have occasioned the development of the design given the name is associated with the first family of the new nation. Relatively diminutive, this matching pair of master salts each stand 1 1/8" high, have top diameters of 1 7/8", rest on pedestal bases that are 1" across, and weigh 1.1 T. oz. combined. They were made by Whiting, whose "lion" emblem, "Sterling," and model number "7" are stamped on the undersides. The cauldron shaped body, tiered base, and beaded detailing suggest an 1870-80 date. Each one is engraved "F.R." in Old English lettering on the upper edges below the rims.